SServiced accommodation in the heart of Aberdeen city centre offering a home environment that is inviting and comfortable, making short and long stays a very enjoyable experience. 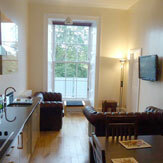 16 Union Terrace - Serviced Accommodation Aberdeen City Centre. 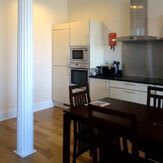 Our serviced accommodation located at 16 union terrace Aberdeen was built in 1830 and recently converted to modern apartments in 2008, this grade B listed building also boasts original pillars in the living room. Sleeps four, with a sofa bed to sleep five if required. Unique feature to the second bedroom is a room divider with locks on each door can convert this to two bedrooms. This centrally located serviced accommodation in Aberdeen city centre is only minutes away from the Music Hall, His Majesty theatre, overlooking historical Union Terrace Gardens. Bedroom One. Double bed with wash hand basin. Lounge. Leather sofas, dining area, wide screen TV. Kitchen. Oven, Dishwasher, Washer / Dryer, Fridge freezer. Bathroom. Bath / Shower, Heated towel rail. View our gallery to get a better look at the apartment. 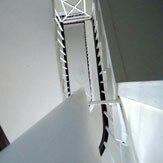 The apartment covers 85 square meters over twice the size of the average hotel room. To make your reservation use our reservation form or give us a call, we will be happy to help you.